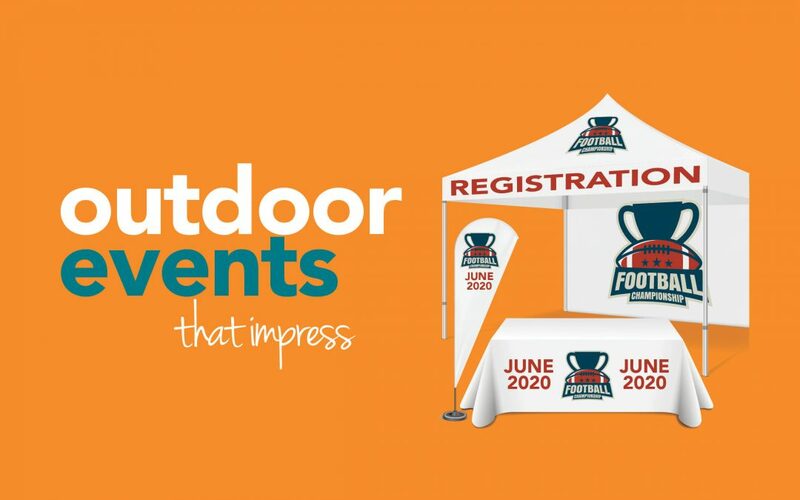 Look to Leech Printing first when planning your next outdoor event. Our custom printing and banners, unique promotional products, and innovative trade show displays will create the professional look your event deserves. Need a tent? We’ve got you covered! Our easy-to-assemble 10x10 pop‑up tents include all required hardware and can be printed with custom graphics on the valance and peak! Pop-up tents are great for souvenir stands, food kiosks, first aid stations, and registration centres. Side walls and backdrops are optional. Add a printed table cloth or runner or a tear-drop flag emblazoned with your custom graphics. Whether you’re planning a charity event/run/walk, a sporting event for thousands, or the ultimate outdoor wedding, our Sales Representatives can show you all the options available to make your outdoor event unforgettable. Give us a call today (local 204-728-3037 or toll-free 1-888-756-4433), or complete our online quote request form.